Our indoor air conditioned weight room is overseen by Peter “The Thai Hulk”. Peter is a cornerstone of our weight lifting and fitness programs. Always a guest favorite, Peter has many friends and guests from around the world that return year after year to train with him. Peter has competed professionally in 2008, 2009, 2010 and 2011 in the Mr Thailand Body Classic body building competition. He placed in the top 5 in 2009, 2010 and 2011. He has been body building for the last 15 years and is a member of the TBBA (Thailand body building association). His specialty is designing different routines for individuals based on their goals, whether that be weight loss, weight gain, strength gain etc. Peter can advise on all aspects of diet, nutrition and supplements. His goal is to give each guest a routine that they can take back home and incorporate in their lives. He tries to instill the benefits of leading a healthy lifestyle in people. Peter is in the weight room 2 x daily dispensing advice and correcting form. Peter is also available for fitness consultations and personal training sessions. Our indoor facility is air conditioned and equipped with all the necessary equipment to train every part of the body. 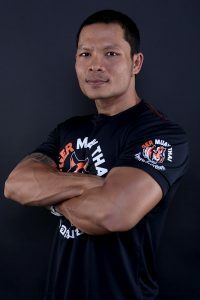 The weight room is a first class development offering By far one of the cleanest, most professional and motivating atmospheres at any gym in Thailand, Tiger Muay Thai’s gym is equipped with a diverse set of amenities designed to make you stronger. We offer Olympic barbells,(bench,squats, cleans,dead-lifts, etc.) dumbbells, squat racks, smith machine and a number of full body machines. We also have a cardio area and locker rooms to keep your possessions safe while using the gym. Whether you are a serious body builder or not, you will feel comfortable here. Please note that the weight-room is currently undergoing renovations and the equipment have temporary been relocated to the Fitness Area, sorry for the inconvenience.